So this time around I came across the battle-plan that completely screws with my army list. Total Commitment. i.e No reserves are allowed. All units must be deployed on the table, or count as slain on turn one. Needless to say, I was not ready for this at all! Ohh soo many Crypt Horrors! 18 to be exact. 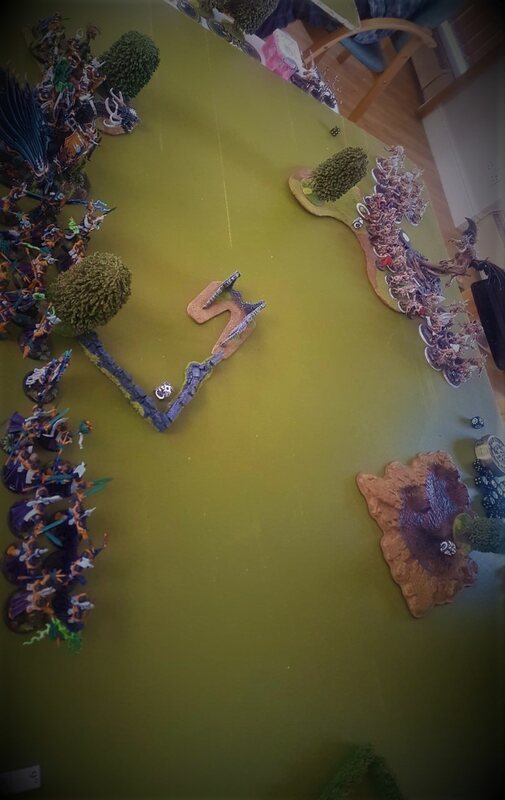 A Varghulf appears to threaten my far right flank. Whilst a Ghoul courtier snaps up his far left objective. Keeping it warm. My turn one, after the court advances. Translocation did not go off, so I could not zip across the board to take early advantage, or pressure the objectives. The Vexillor banner and rain of stars but down quite a few wounds, but nothing that wont be healed back from the Courtiers, or the zombie dragon. I win turn two priority, and get Translocation off. I fail to cast Cogs however, leaving my furthest Evocators out the back a little stranded needing a 9" charge. 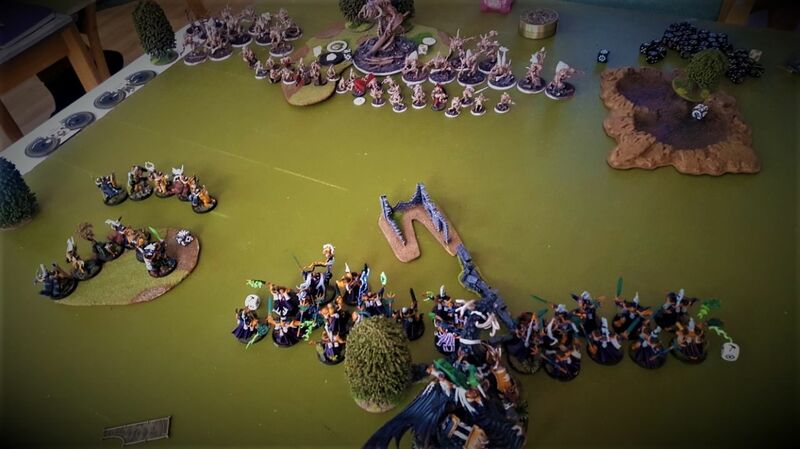 The closest Evocators however, have no problem chewing through the 30 crpyt ghouls, whilst being within 3" of the Zombie dragon, and causing 16 mortal wounds! I didn't get as many pictures beyond or in between these points, as I was to busy trying to figure out if there was anyway to win the match. Unseen on my far right flank, the Varghulf had annihilated my liberator unit, and took an early lead on VPs. The quickest unit I had to counter it was actually my Stardrake, which was over kill, but w/o Cogs or Translocation, it was the only thing that could get there quick enough. In terms of lessons learnt, I really need a dedicated plan for this battleplan. It hard counters my alpha strike and main purpose of the list. Which is effectively, somewhat regardless of objectives to reduce my enemies effectiveness to cover for my lack of flexibility. Back to the drawing board in terms of approach, but took me by surprise from GW. Although I do like it as its made me question my list, and thought about making it more generic to cover multiple missions types. That is an interesting mission for sure. Takes away some of the oomph stormcast use in their battle strategy. Thanks for the report.